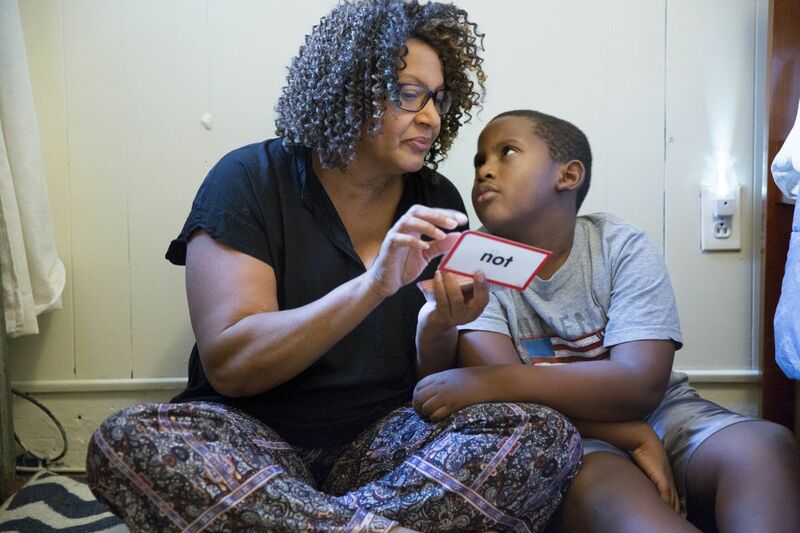 Avril Absolum uses flash cards to work with her son Jalen, who was harmed by lead poisoning. Unlike some states, Pennsylvania doesn't require children to be tested for lead exposure by age 2. As a result, thousands most at risk of effects from the toxic metal, including reduced IQ and behavioral problems, go undetected at a critical time in brain development. But on Wednesday, Gov. Wolf called on state health officials and lawmakers to work together to pass a law requiring physicians to test every child's blood for lead by age 2. "Only with universal testing will we know the true scope of lead poisoning in Pennsylvania and be able to refer affected children to care," Wolf said in a statement. The governor's call for mandatory testing comes at a time of heightened concern over lead exposure in the aftermath of a crisis in Flint, Mich., where the city's population was exposed to lead-contaminated drinking water. Last year, the Inquirer and Daily News detailed how thousands of Philadelphia children, year after year, are newly poisoned by lead at a far higher rate than those in Flint. Here, the primary culprit is flaking and peeling lead paint in a city where more than 90 percent of homes were built before the 1978 lead-paint ban. In a more recent story in the series, "Toxic City," reporters tested soil in 114 locations in Fishtown, Kensington, and Port Richmond. Nearly three out of four had hazardous levels of lead contamination, a problem of previously unknown severity. If Pennsylvania requires universal testing for those under age 2, the state would follow Maryland, New York, New Jersey, Delaware, and others that have some form of mandatory testing. Federal law already requires physicians to test all children covered by Medicaid insurance for lead exposure at ages 1 and 2. Rachel Levine, a physician who is the state's acting secretary of health and physician general, said that while pediatricians would be required by state law to administer at least one blood test — either a finger prick or a draw from a vein — before a child turns 2, there likely would be no fines or penalties for failure to comply. "I don't think we are going to start to fine physicians, but the legal standard of care would be to do this testing," she said. Levine said the governor's action came in response to a recent state report that showed only 27.8 percent of children under 2 were tested for lead in 2015. "The whole idea is to develop a long-term, comprehensive lead-poisoning prevention strategy, and to be able to do that, we need complete data, and right now, we only have partial data," Levine said Wednesday. The state report also tracks the numbers by county. Philadelphia had higher testing rates than other cities, with 76 percent of children screened by age 2. Donna Cooper, executive director of Public Citizens for Children and Youth, an advocacy group, praised the Wolf administration for advocating universal testing. "I think it's a great thing that the governor is shining a light on the problem of the risk of lead exposure among children in Pennsylvania," Cooper said. "There are long-term consequences when we don't know if a child has been exposed because they are not treated." Cooper said the next step must be to go after more resources to fund the remediation of houses with toxic paint so children aren't exposed to lead at all.